As a teenager I was keen to learn how to drive, it represented independence, and as I watched my father, I remember thinking “how difficult can it be?!”. You point the car in the right direction and occasionally you have to press a pedal and change the gear – simple, right? So eventually it came to my first lesson (with my father … big mistake!) and I discovered that actually getting the car to move was quite a challenge – I stalled many times before I got the hang of releasing the clutch. And as I jolted off down the road “kangaroo style” not knowing how to move between gears, I became acutely aware of my lack of driving skill – I was in “conscious incompetence”. Until that point I was ignorant– I had been in “unconscious incompetence” and blissfully unaware of what it really took to drive a car! Now after much crunching of gears and of hitting curbs (turns out pointing the car in the right direction wasn’t easy either! ), after arguments and tears and enlisting a professional driving instructor, I did finally pass my test. At this point, I was super-vigilant and thoughtful especially when driving on my own with no-one to watch out for things I had not noticed or to check which turning I should be taking. If I had a passenger, I would stop the conversation as I approached a junction so that I could concentrate fully. I was living the text book technique ….“mirror, signal manoeuvre” was a mantra in my head. 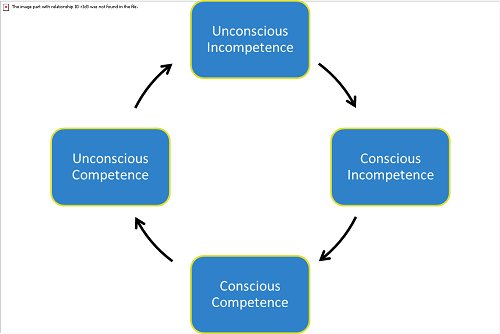 For this period of my driving “career” I was operating on the “conscious competence” part of the cycle. It took effort. Later as my confidence grew I was able to multi-task – driving along, even navigating junctions I was able to talk to a passenger. No longer did I clip the curb as I turned, no longer did I have to think about depressing the clutch whilst changing gear and on a good day – I even went smoothly from third gear straight to fifth gear. It felt like I’d arrived – I was operating in “unconscious competence”. My third job was as a Regional HR Manager – I drove about 1,500 miles a week. Soon I could not only have a conversation on the phone (hands free, even in those days!) but I found I could eat a sandwich (tuna and sweetcorn came with the fewest consequences!) and balance a bottle of water in my lap all whilst overtaking on the outside lane of the motorway. Well I was busy!!! And it won’t surprise you in the least to hear that I encountered a number of near misses in that outside lane. Through an over-confidence and a lack of concentration I’d unwittingly slipped right back to the start into “unconscious incompetence” – despite all my experience, I was no longer a safe driver. So what has this got to do with coaching supervision I hear you ask? Well, I imagine that for many of us our aspiration as a coach is to operate in the “unconscious competence” zone? This is where we experience flow and we can dance in the moment with our client… and yet when we look back on those moments, often we cannot recall exactly what we did and why we did it. And by the way this is often true for those more clunky moments – we’re stuck and we’re not really sure how it became so. That’s why supervision is so useful. Supervision offers us an opportunity to step back and step into the “conscious competence” zone. You are no longer driving solo, you have a co-driver who can help you unpick what happened, so that you become truly aware of what you choose to do and why. Indeed I suggested, that for a coach to do their best work in the client session, they probably need to be operating in the “conscious competence” zone and not the “unconscious competence” zone. One of the delegates asked the question whether being consciously competent could get in the way of your coaching presence, and your connection with the client. My answer on the webinar was that I think skilled coaches manage to find a blend between the two – they are both able to be in the moment and to seamlessly check in with themselves and their client and understand what is creating that moment. And actually … that does take effort. I’d be interested to hear how you would have answered that question ….? Note 1 : This learning cycle is attributed to Noel Burch of Gordon Training Institute in the 1970’s as well as Abraham Maslow. Here’s a link for more information. We’ll be running this webinar again sometime soon – so keep an eye on the events page and do join us next time. There is no charge to attend this webinar.